Sitting at the hospital waiting for his mother to complete her chemotherapy session, Will Schwalbe asked her what she was reading. Hours and hours of poison dripping into her arm could be made bearable by reading books and talking about them. Will and his mother, Mary Anne, formed their own two person ‘book club’ and Will called it The End of Your Life Book Club. With a diagnosis of Stage 4 Pancreatic Cancer (there is no stage 5) both knew that Mary Anne’s days were numbered but there were still so many great books to be read for the first time or old favourites to be read again. Metastasised pancreatic cancer comes with a short shelf life – typically as little as 3 to 6 months, optimistically, no more than a couple of years. It’s not easy to talk to people who know they are dying; it’ s not even easy to talk to people who have cancer who are probably going to live a long and full life. There’s just so much baggage in the way that interferes with what needs to be said. Will and Mary Anne use their reading to open up lines of discussion that would be much harder tackled head on. It’s easier to talk about characters in books who are struggling with challenges than to admit that you’re not doing so well with your own challenges. It’s also not easy to tell a readership of strangers about someone else’s cancer story and your part within it. The book club structure brings a twist to Will and Mary Anne’s story that’s missing from most cancer biographies and autobiographies. If you are anything like me you’ll have one half of your brain following the progression of the disease and the other half scribbling down the book recommendations. 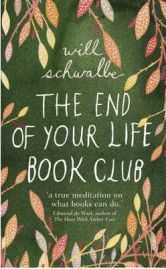 Reading ‘cancerographies’ is hard work – I know, I’ve read a lot – but the ‘book club’ brings an alternative approach. It helps of course if you are a book lover and can relate to the passion for reading, but even prolific readers will find that the book teaches them not only about life and death but about the power of a really good book to move you and to peel of the onion skin layers of ‘what you already know’ and reveal deeper truths. As a book lover who has had cancer – fortunately a much more treatable one than Mary Anne – I could totally relate to the need to devour literature up to the final moment. When I heard I had cancer I thought to myself “I can’t possibly die, I have far too many books still to read”. Will Schwalbe is not just a nice guy who sat by his mother’s side through her treatment and her decline. He’s also – thank goodness – a very good writer. I guess you can’t work in publishing for as long as he had and not learn to write well. I’m grateful for his skills as it’s so hard to review a poorly written cancer book and not feel lower than a snake’s belly for criticising the style or the grammar. Will’s also a good biographer and tells us as much about his mother’s amazing life and her outstanding achievements as he does about her illness. There’s no way anyone reading this can escape from the realisation that Mary Anne Schwalbe was someone very special who had dedicated her life to humanitarian work all over the world as well as to breaking down barriers to women’s education in the USA. He introduces us to one of life’s really GOOD people – a woman who pays for the drugs that another patient needs but can’t afford, who sends a student overseas on a bursary for an award that doesn’t really exist just so she can get him to take the money, and always a woman who balanced her love for her family with her driving passion to contribute to a better world. At the time of her diagnoses and through her treatment, Mary Anne continued to campaign for a library in Afghanistan, only giving up when an exhausted benefactor gave in and made a massive donation just so that he could tell her to stop working so hard. We are introduced to this feisty and highly principled woman and thankfully given more time than we expect to get to know her pretty well. I was fascinated by the things she’d achieved, by her belief in others and her unwavering religious faith. I thank Will for giving me a chance to know more about this remarkable woman. No Comments on "The End of Your Life Book Club"